Demonstrations: Surface Decoration on Clay by Guitta Melki and Bettina Ammann. 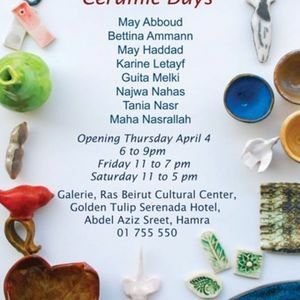 My journey in clay sculpture: an exhibition of a selection of May Haddad’s works since the nineties included are masks, tribute to artists, ethnic symbols and a tribute to trees. 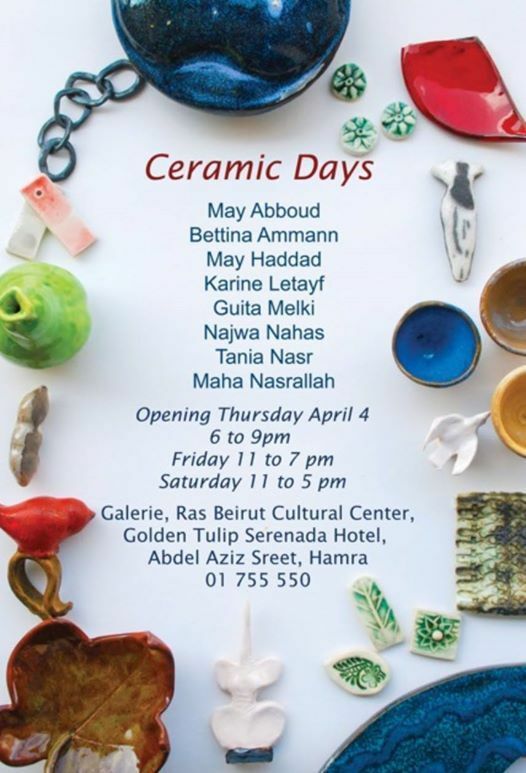 Ceramics Collective is a platform of 8 artists living in Lebanon and who share passions for ceramics, arts, and creativity. They are: Bettina Ammann, Guitta Melki, Karine Letayf, Maha Nasrallah, May Abboud, May Haddad, Najwa Nahas, and Tania Nasr. Sincere gratitude to May Abboud for initiating the process. The center aims at reviving culture in Ras Beirut area by hosting free cultural events that are open to the public included are arts exhibitions, book signing, theater, poetry reading and other. Events are organized in the Venues of the stunning landmark building of Golden Tulip Serenada Hotel, the Home of Ras Beirut Cultural Center.